Getting published is difficult – I probably don't need to tell you that. It requires a lot of skill and more than a little luck, but all the luck and talent in the world can be made to count for nothing if the approach you take to submitting your work is inappropriate or unprofessional. Just how wrong writers are still getting this was highlighted recently by one of our competition entrants, so in this article I'll be pointing out the mistakes she made, how you can avoid them, and how you can make sure you don't throw away your writing career before it's even begun. In this particular instance, the entrant in question (we'll call her Mrs X) had submitted several poems for consideration in our International Poetry Competition. She then contacted us, asking to withdraw one of her poems and replace it with another one. Any of you who have ever entered writing competitions (and taken the time to read the terms and conditions) will know that even contacting a competition organiser regarding your submission is normally a big no-no. Pretty much all competitions will specifically state that no correspondence will be entered into regarding individual submissions (see for instance the rules for the Annual Fish International Poetry Prize (http://www.fishpublishing.com/annual-fish-international-poetry-prize.php#rules): "No correspondence will be entered into once work has been submitted") and firstwriter.com is no different. If you weren't aware of that fact then make sure you take great care if you ever feel you have to contact a competition organiser about an entry you've made – it may be enough to disqualify you from some competitions. If you are trying to confirm that a competition has received your entry then check before you enter if they have a specific system for this. Some competitions will ask you to send a stamped addressed postcard with your entry which they will post back to you to confirm receipt. If you fail to include such a postcard and then contact them separately asking for confirmation then they're liable to be justifiably annoyed. If they offer online entry then they may also offer a means of tracking your submission online. If they do, they will also be likely to be annoyed if you contact them asking for information you could have got yourself. The same applies generally for information regarding the competition. Check the documentation (whether it's a brochure, an entry slip, or information online) thoroughly for an answer to your query before resorting to contacting the competition organiser. Most of all, read the terms and conditions carefully, and if they specifically state that you can't do something don't waste your time and the competition organisers' time asking for an exception to be made. There's a reason why the competition organiser sets the rules it does, and you shouldn't expect to be treated any differently from everyone else who enters. It should be fairly obvious why competitions aren't willing to enter into correspondence about entries, but if you need it spelling out then it all comes down to time and costs. Most writing competitions are run by small and/or voluntary organisations, charities, and educational establishments. None of these have large staffs that can be dedicated to answering endless queries from entrants. The entry fees are generally set as low as possible, and the prize as high as possible, and no margin is left for employing people specifically to answer emails. Answering your questions might also be more difficult than you think. Lots of competitions will make your entry anonymous so it can be judged blind. Trying to work out which entries are yours and what their status is can therefore be very difficult and time consuming, and could entail having to manually sift through thousands of entries. So, Mrs X has already made a boo-boo just by contacting us, and has compounded this by asking us to alter her submission, which is specifically prohibited under the terms and conditions of not only our competition, but pretty much every other writing competition you're likely to come across (see for instance the Bridport Prize (http://www.bridportprize.org.uk/rules.htm), the biggest writing competition in the English language: "No corrections can be made after receipt"; the Fish International Poetry Prize: "Poems cannot be altered or changed after they have been entered" and so on). The reason for this rule should be even more obvious than for the last – not only would the administrative time of constantly updating, correcting, swapping and altering entries on every writer's whim be totally prohibitive, but you also need to remember that as soon as an entry is received it starts a journey along a judging process. If an entry gets to the shortlisted stage then it may have been read several times by several judges – if you then decide you want to swap it then that process has to start all over again. Worse still, an entry might be about to be pronounced the winner – if it were then to be withdrawn the entire judging process would have to start all over again to search for a new winner. No competition could afford to operate in such a way. So if you're entering a competition, don't expect to be able to change, correct, or withdraw your entries. The chances are that you won't be allowed to. You need to bear in mind that when you enter a competition you are committing your pieces of work, as they stand, for the full duration of the competition. You also need to bear in mind that you may be making commitments regarding the rights to your entries. Most competitions will want to publish the winning entries, and by entering the competition you will often be granting the organisers at least some rights of publication. In some cases you may be giving them total ownership of your work (see for instance a poetry contest run by Oneida County Tourism Council (http://www.co.oneida.wi.gov/county/app/docs/oneida/200712211006521631931.html): "All poems become property of Oneida County Centennial Committee and may be used as the committee deems appropriate"), in which case you would have no further right to reproduce or publish the work you had submitted. In most cases, however, competition organisers' demands are more moderate. They may, for instance, require the rights to your work for a specific period, before they revert back to you (see for instance the Fish International Poetry Prize: "Copyright returns to the author one year after publication of the anthology"). In such a situation you would be unable to do anything else with your work until the end of the year after the anthology was published. 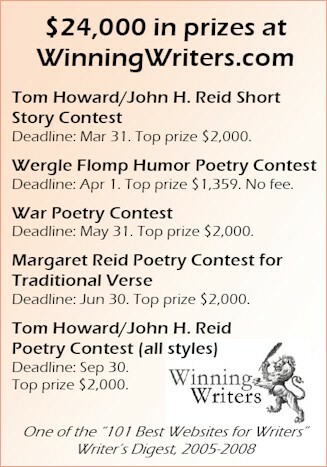 Other competitions, like firstwriter.com, are more flexible still, leaving copyright with the author, and only requiring the right to publish the work if it is a winner (see for instance the Bridport Prize: "Worldwide copyright of each entry remains with the author, but the Bridport Prize will have the unrestricted right to publish the winning poems and stories, (including runners up)". In these situations you are free to submit your work to other competitions, magazines, etc. and can have them published elsewhere even while they are entered in the competition – but you have to bear in mind that there is the chance that your work might be published by the competition you have entered it into, and you won't have the right to stop that. That means you can offer your entry to other competitions and magazines that are happy to receive simultaneous submissions, but you can't offer it exclusively to anyone. This is where Mrs X made her next big mistake. After committing her poems to our poetry competition and granting us the unrestricted right to publish them she then subsequently signed an exclusive contract with another business, granting them the exclusive rights to publish one of the poems she had submitted to us. The thing is, that was a promise she couldn't legally make because she had already granted firstwriter.com the right to publish that poem. I don't need to explain how unprofessional that is. It's like signing a contract to sell your house to one person one day, then signing another contract to sell it to someone else a few days later. It's the kind of thing which – if you allow yourself to get a reputation for it – will put editors off you like crazy. And don't fall into the common trap of thinking that something isn't a contract or isn't legally binding just because you haven't signed a piece of paper. Any agreement can form a legally binding contract. You can enter into a contract by pressing a button, parking your car in a car park, or by doing anything else where it is made clear that by doing so you are accepting certain terms and conditions. Usually, whenever you enter a writing competition, you will, by doing so, have entered into a legal contract where you agree to be bound by the rules of the competition – which will usually involve granting some rights to publication in one form or another. It's therefore important to always check these carefully, so you know what you will and won't be able to do with your work after you enter it. Finally, Mrs X has one last lesson to teach us, and that's how not to react if you find you've got yourself into this kind of mess. If you find you've accidentally given two different publications the rights to publish your work (and at least one of those is an exclusive deal) then you need to bite the bullet and be up-front and honest with both of them – particularly the one you have given the promise of exclusivity, which you may not be able to keep. You need to make them aware that you had already given someone else certain rights to the publication of your work. You could try negotiating with one party to give up that right, but remember that you are asking a favour. You've got egg on your face here, and you're in no position to start making demands. A little humility will go a long way. Certainly, don't do what Mrs X did, which was to make threats of litigation and involve her attorney. You're not likely to have a legal leg to stand on (in fact, if you've granted conflicting publishing rights to two different businesses then you're more likely to be the subject of successful litigation than the initiator of it), and you're only going to antagonise the publisher who you're actually seeking help from. Worse than that, you could risk ending your writing career before it's even begun. Litigation means publicity, and once editors get to know you as the writer who promises work to different publishers at the same time, then tries to sue the one she first promised it to if she changes her mind, they're not going to touch you with a stick. Who's going to accept a writer's work, knowing that they have a track record of suing people who accept their work? The best solution, of course, is to avoid getting into such a situation in the first place. Whenever you submit your work anywhere do so carefully, as if you are handling something of value (which you are, aren't you?). Take your time. Read all the information. And above all, make sure you know what rights you are or aren't granting, and only proceed if you are happy to stick to what you've promised. If you do that, you don't need to worry. You can enter competitions with confidence, safe in the knowledge that they are generally run by genuine folk who will understand and stick to the terms and conditions – you just need to make sure that you, as an entrant, do likewise! For several months, I worked for a small town newspaper as staff reporter. I wrote front-page news, feature stories, editorials, obituaries, classified ad copy – you name it – I did it. I was on the payroll making minimum wage but I was improving my writing ability every day. Little did I know that the hands-on experience I received was way better than attending a writer’s class. I was out there, reporting the news and honing my craft at the same time. With the experience I gained from working at the paper, many good things have come from it. I started my own business about 12 years ago and it is still in operation today – I started my own newspaper. It has been a blessing running the kind of business I enjoy and being able to utilise my talent as well. My advice to writers: keep believing in yourself, and don’t give up. Write every single day, even if it’s no more than a letter, or a paragraph in your diary or journal. The key is to write everyday. You may never own your own newspaper (that was what I chose – it’s all I knew at the time, and I needed a job!). But you can have your own writing business if you tried hard enough. It’s not easy – a lot of hard work goes into everything you do. I found my venue to hone my writing cravings and so can you. Scarletta Press are now accepting submissions of literary and commercial fiction, memoir, how-to, political and social science, and business books. Horror Bound Magazine, a magazine of horror/dark fantasy/noir/slipstream and thrillers, is now accepting short stories (up to 7,000 words maximum), poetry, book excerpts and art. Short stories between 3,000 words and 7,000 words inspired by Edgar Allan Poe are also being sought for an upcoming anthology with the working title "Return of the Raven". Simply Read Books is currently looking for middle grade fiction, young adult fiction, graphic novels, and nonfiction for kids. Chicken Soup for the Soul co-author is looking for uplifting true stories, between 500 and 750 words, about boys aged 3–8 who have spoken about what they would do if they were a superhero, or done something in some way heroic themselves. @gmail.com by March 6, 2009, including a picture of the "little hero". Publishers are reporting significant drops in sales in 2008. HarperCollins lost 75% of its operating income during the first six months, and holiday sales have been abysmal, leading to job losses in most major publishing houses in recent months. Placing a book is therefore harder than ever. Writers will either have to make even more submissions to be successful, or use the downturn to build writing credits with magazines and competitions. Either way, access to a professionally-maintained service such as firstwriter.com is now more vital than ever in order to gain that key advantage.